Skin is not only for the protection of internal organs, but also one of the primary beauty assets. The health of the skin depends on many factors, some of which we never hear about. Skin is 16% of the entire human body. It is the largest organ, responsible not only for protective functions, but many other physiological processes (pigmentation, metabolism, thermoregulation, etc.). The total mass of the skin is about 40 kg. It has a length of about two meters. The process of cell regeneration is so fast that about 50,000 of them die every minute, becoming dust. We can hear with the skin, and it’s not because we have mini-ears somewhere on our body. It is explained by the fact that there are patches of skin that can perceive sounds around the outer ear. These zones are located behind the auricle on the temporal bone. Cholesterol provides protection for the skin. Studies have confirmed that cholesterol has approximate properties of antioxidants, protecting the skin from the effects of free radicals and UV rays. It is better to apply perfume to moisturized skin, so a pleasant trail of scent stays for a long time, and the smell will act on its highest level. The best time to do it is right after taking a shower. The saying “goosebumps” is explained by the thermoregulation of the skin. The bumps are caused by trapping of warm air by the receptors that are on the surface of the skin. Nails, ears, and lips never sweat due to the lack of sebaceous glands. Therefore, caring for them requires more attention. Acne is not only a skin disease, but also one of the most common skin problems in the world. According to research, every twentieth woman and every hundredth man on the planet suffers from acne between the ages 12 and 45. Our lips have more receptors than the fingertips. This explains the sensuality of kisses, which gives us the first signal about love. With age, the skin becomes thinner due to loss of collagen and other elements. Pomegranate seeds contain substances that hold collagen and prevent free radicals from affecting the skin. Include pomegranate in your diet to make the skin supple and to prevent premature aging. How to not lose your beauty? When a person is born, the color of their skin is significantly different from that of an adult.The permanent shade is acquired only by the first year of life. The skin structure is also improved over the years. Under the influence of many factors, the skin loses its elasticity and healthy color. With age, we acquire wrinkles, pigmentation, and other changes. Use UV protective creams, even in winter. It will not only prevent skin cancer but also protect your skin from water loss and other negative impacts. Avoid excessive sun exposure or visits to the tanning salon. Use only high-quality water for washing. Harmful components can contribute to skin deterioration and cause some pathological conditions. Periodic spa treatments not only help to relax but also maintain the skin in a healthy state. Proper nutrition improves the condition of the skin and prevents the development of various skin diseases like eczema, psoriasis, hives, etc. If you drink up to two liters of water per day, you will avoid dehydration and metabolic disorders that support the health of the skin. Physiotherapy procedures improve blood supply and lymphatic drainage. It cleanses the skin from dead cells, which can be an excellent medium for pathogenic bacteria. Modern dermatology has learned how to stop aging with the help of phototherapy. 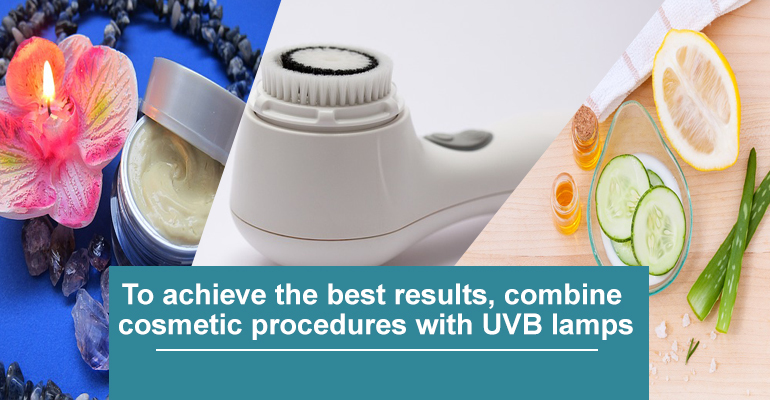 For the best effect and quick results, you can combine cosmetic procedures with a UVB lamp. This method will help to improve blood circulation and lymphatic drainage, providing healthy skin color. The retention of collagen restores skin elasticity, which will stop the appearance of wrinkles.